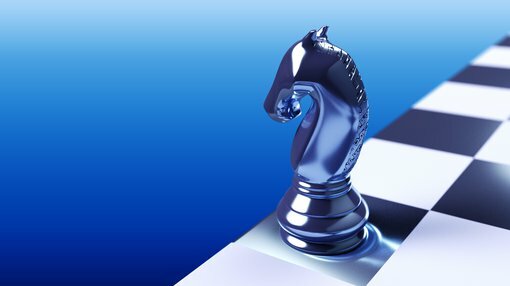 WA-focused gold exploration and development company Classic Minerals Limited (ASX:CLZ) has today provided an update on its exploration targeting strategy at its Fraser Range Nickel-Copper-Cobalt Project in WA. Although CLZ has been primarily focused on gold exploration at its flagship Forrestania Gold Project, the company has recently completed a review of its Fraser Range dataset to reveal several high-priority targets. This comes as interest in nickel-copper-cobalt exploration in the Fraser Range increases, following the recent discovery made by Mark Creasy less than ten kilometres from CLZ’s Fraser Range project. Creasy’s “Silver Knight” deposit contains a current JORC Resource at 4.2m/t grading 0.8% nickel, 0.6% copper and 0.04% cobalt, including a higher grade 200,000/t grading 3% nickel, 1.9% copper and 0.17% cobalt. Creasy has applied to convert the Silver Knight tenement into a mining lease which suggests that the deposit is economic and expected to grow. Classic CEO Dean Goodwin said, “The time is ripe for us to re-assess our Fraser Range project which has generated exciting targets requiring further follow up. 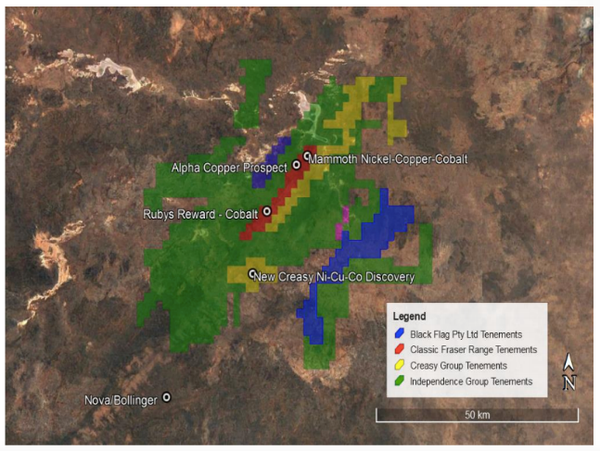 As shown below, CLZ’s Fraser Range tenure is surrounded by major holders and successful explorers/producers such as Independence Group (IGO) and the Mark Creasy Group. CLZ views the proximity of its tenure in relation to IGO and Creasy Group holdings as extremely encouraging. Tenure surrounding Classic’s Fraser Range Project. The Mammoth prospect appears to represent a genuine mineralised nickel-copper system. The grades intersected so far are generally modest, but the presence of such a system is considered by CLZ to be highly encouraging. As with the Alpha deposit, the top priority at Mammoth will be defining larger and consequently more strongly conductive targets which may indicate thicker and/or higher-grade mineralisation. The anomaly in drill hole FRRC018 corresponds to the Mammoth mineralisation. 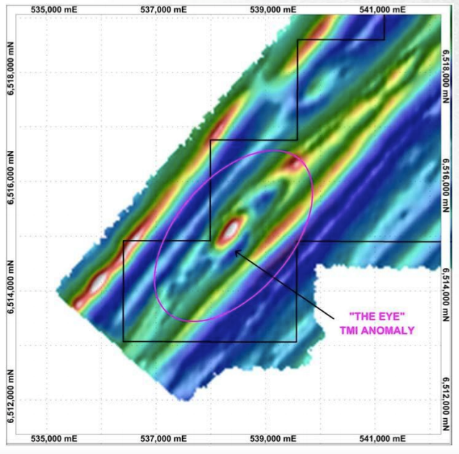 Given that the anomaly appears to correspond to a horizon of higher grade mineralisation, it’s worth drilling a deep hole into the centre bottom of the plate to assess for grade and as a platform for DHEM to assess for any further down-dip continuation. CLZ sees great potential with following up the numerous Mammoth-style anomalies and delineating the next nickel-copper ore body in the Fraser Range. Hole FRRC001at the Alpha Copper prospect intersected 1m at 1.95% copper, 0.11% zinc, 4.5 g/t gold and 13 ppb gold from 103m. Mineralisation is regarded as a possible vein which may be associated with a larger mineralized zone. Twelve RC holes drilled at Target A2 along the re-interpreted EM conductor, intersecting thicker mixed sulphides, with up to 20% sulphides in some samples, and in zones up to 12m thick. The mineralised zone is over 200m long and over 60m wide, plunging about 30 degrees to the NNW and outcrops as narrow, iron rich rocks. 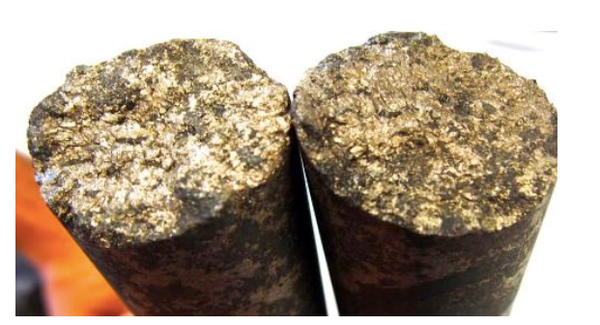 Includes 1m at 1.04% copper at 27 m within a 5m thick zone of iron copper mineralisation in hole FRRC016. DHEM surveys have been undertaken on two wide spaced holes to help revise the conductor position. The company believes deeper drilling should be undertaken at Alpha to explore for depth extensions to the current mineralisation. The “eye” structure in the south of the tenement is interpreted to be a large mafic intrusion, possibly fertile for nickel-copper mineralisation and similar to the Nova/Bollinger intrusion system. MLEM, FLEM and geochemical sampling over the whole feature is being planned to assist with drill targeting. CLZ has planned a 200m x 80m soil sampling program over the 2.5km long southwest-northeast orientated oval shaped airborne magnetic feature (identified from TMI survey data). Similar to Sirius’ Nova discovery, the magnetic feature — due to its eye-like appearance — has been colloquially called the “Eye” with the core of the Eye interpreted to be a dome or plug of ultramafic rocks or a layered mafic-ultramafic intrusion. Nova was discovered by the exploration of its own “Eye” prospect, so named because of a lenticular shape seen in the magnetic data. Should the proposed geochemical sampling and mapping produce encouraging results for CLZ, the team has planned a RAB/aircore drilling program and a ground moving loop electromagnetic survey (“MLEM”) both to be completed at the Eye to delineate targets at depth for drill testing. The RAB/aircore drilling will aim to drill to the base of the regolith over the eye-shaped airborne magnetic feature. CLZ has conducted a number of geophysical surveys over the Fraser Range project that have yielded an impressive number of targets (18 conductors in total). 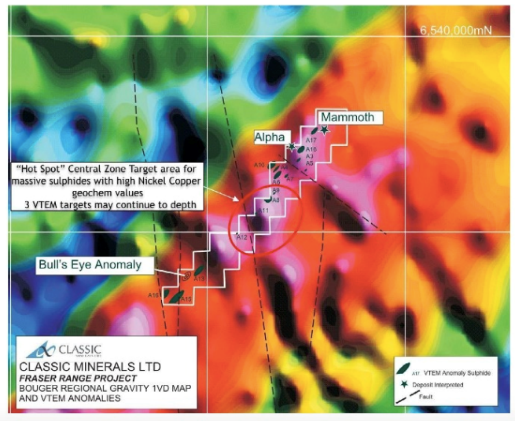 The prospectivity for discovering a large massive sulphide orebody on its Fraser Range tenement has received a big boost with preliminary results from a new Sub Audio Magnetics (SAM) survey identifying a major EM anomaly one kilometre long, extending from 40m to at least 500m deep, which is a further 350m below the depth of existing drilling at prospect A17. The survey, completed over the northern part of the tenement, has focused on a trend running northeast through the Alpha Copper Deposit and Mammoth Nickel Copper Deposit. In addition to the EM anomaly at A17, three new conductors have been identified at depth and the conductive target “hot zone” in this already target rich area has been extended to over six kilometres in strike. CLZ advised its upcoming exploration will be focused on the Central Hotspot with additional surveys, geochemical sampling and eventually drilling to test the targets — all likely to commence in the current quarter.